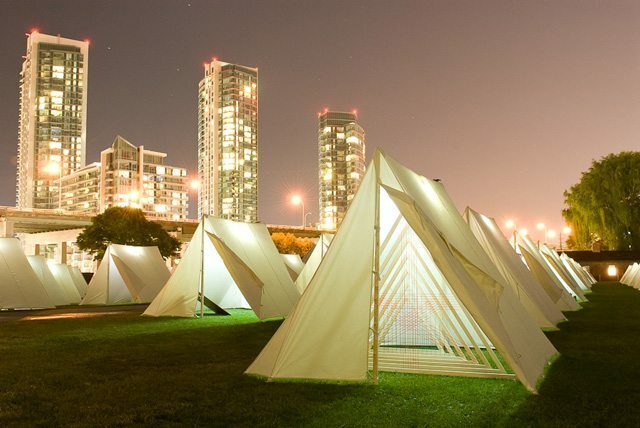 Within each tent, creative approaches to the stories of those who lived through the War of 1812. 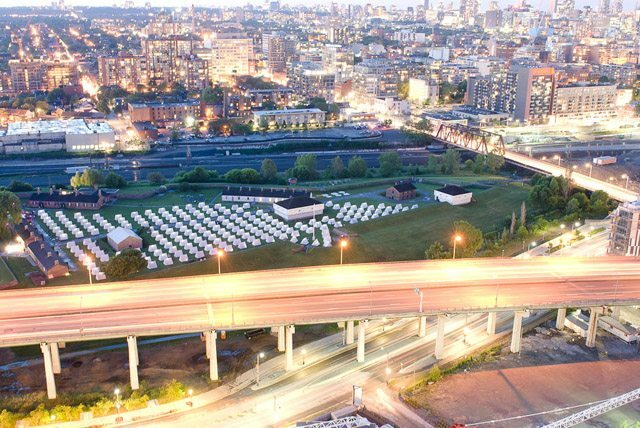 If you’re considering checking out The Encampment, it’s best to do so at dusk. As the colours of sunset fade to black and your eyes adjust to the approaching night, rows upon rows of white illuminated tents emerge. Attendees become shadows drifting across the grounds of Fort York, appearing for a moment on one tent before shifting to another. 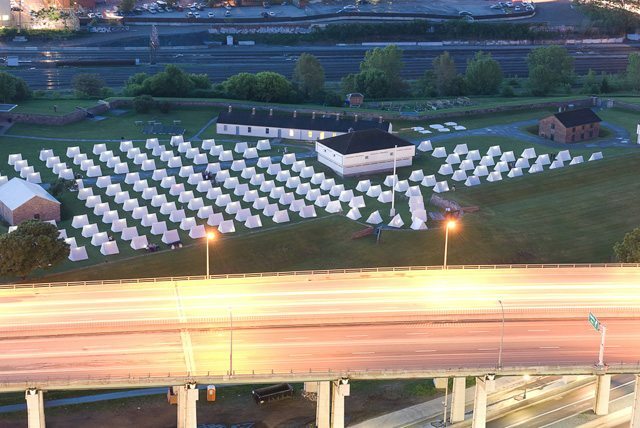 Housed within the 200 tents are a wide range of interpretations of the lives of those who lived through the War of 1812. The “creative collaborators,” who worked under the supervision of artists Thom Sokoloski and Jenny-Anne McCowan, took approaches ranging from straightforward documentation of a person’s life to highly symbolic representations of individual war experiences. We were charmed by the creativity displayed in most tents, though we admit some left us scratching our heads over what the artist’s point was. One of the strongest exhibits revolves around William Warren Baldwin, a lawyer whose postwar career saw him become a prominent advocate of responsible government (which his son Robert would see to fruition as co-leader of the Baldwin-Lafontaine government in 1849). 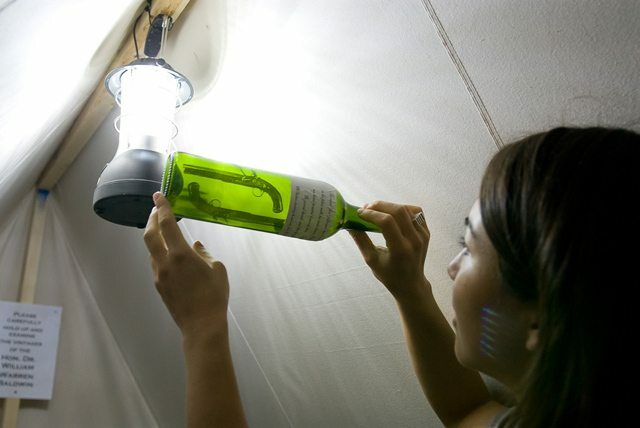 Visitors to tent 172 are asked to “please carefully hold up and examine the vintages of Hon. Dr. William Warren Baldwin.” A wine rack filled with bottles sits in the middle of the tent. Each is labelled with a quote from Baldwin or a reference to his life, and instead of wine, the bottles are filled with an image printed on a transparency that is literally or symbolically related to the label—for example, a label where Baldwin describes his wife is accompanied by a picture of a key, presumably to her heart. It’s a neat effect that tied facts and visuals together well. Examining one of William Warren Baldwin's "vintages." Other elements that caught our eye included bloodied sheets marking the demise of American officer Zebulon Pike at the Battle of York (tent 127); a table containing “Paul’s To Do List” (Paul Jennings, tent 131); chained shoes and a toy train track symbolizing the Underground Railway activities of African Methodist Episcopal Church founder Richard Allen (tent 93); and sketches of Fort York pasted above a set of walls (military engineer Ralph Henry Bruyeres, tent 120). The subjects provide a good sampling of the cultural groups involved in the war, from First Nations people to prominent Toronto figures whose family names remain visible on our streets and schools (Baldwin, Jarvis, Ketchum, Strachan, Wood). The creators largely succeed in their goal of treating the installation like an archaeological dig—wandering into each tent reveals a new artifact or tidbit of information, with many elements lying on the grass like newly unearthed objects. We overheard visitors discussing what they had learned in the tents in tones similar to stereotypical movie archaeologists excited about finding an Egyptian treasure. Don’t worry, there’s no danger of a mummy’s curse or zombified War of 1812 soldier attacking you. Still, if you wander through a quiet section of the installation, you might wonder if the shadows around you are the tent subjects checking their own stories.